In New York, Bipolar disorder has become as popular as insomnia was ten years ago. Everyone’s got it: men, women, babies, the subway system. On a recent trip, the girl whose floor I was kipping on in Gramercy shook me awake one morning, screeching that her Bichon Frisé needed help because it wouldn’t get off the sofa—not to eat, not to doo-doo, not even to have its nails done. Her explanation? Bipolarity. And this could partly explain the recent hoo-hah surrounding the singer/songwriter/artist Daniel Johnston. The film The Devil and Daniel Johnston is on the verge of its British release; he is a vital component in this year’s Whitney Biennial; and is also the subject of a solo retrospective at the Clementine Gallery in New York. Having spent a good couple of decades schlepping around the esoteric borders of the artworld, it seems he has finally taken centre-stage, and I’m sure the ‘mad genius’ persona that has been forged around him has something to do with it. English, in case you didn’t know, is an artist who calls himself ‘controversial’ as readily and vehemently as other people call Johnston tormented. He’s one of those “I’m wacky, me” types that you avoid at parties, and I take great pleasure in bursting his bubble. Indeed, Johnston’s following is ardent and passionate, but is neither eccentric nor particularly underground these days. Some would call this a problem, though I for one am glad he has been finally ousted into the public eye. Not a sell out necessarily, more of an inadvertent cash-in on his own obscurity. The question is, is he ready for it? Based on the works in the recent Clementine show, I would assume yes. Despite being essentially cartoons scrawled out in felt-tip pen, they are undeniably mature in both subject and style. There are those that relate directly to American pop culture—using multicoloured images of Captain America and Casper the Friendly Ghost—but are not nearly as interesting as the more sober, monochromatic drawings of skeletons, mutilated bodies, and Martians. These are the ones that prove Johnston should be taken seriously: not because of his depression, not because of his cult following, but because of his ability for laconic self-_expression. Many of these are illustrated with succinct and expressive little phrases, which reveal Johnston’s past despairs and struggles. Just like the scarily precise lines on his drawings, these are far more articulate and lucid than his press people—and perhaps his oldest fans—would have us believe. They aren’t long-winded, nor are they symbols of a wallowing, self-indulgent artist, they are merely slogans of an inherently poetical soul. One that really struck home was “Good grief, what’s so good about it?” With this one sentence, Johnston manages to simultaneously point out the hype surrounding his art (both aural and visual), as well as successfully providing the answer for it. Later in the year, the National Gallery will exhibit their ‘Rebels and Martyrs’ show, documenting how the idea of the artist as suffering and isolated was pedalled in the nineteenth-century. Munch, Schiele and quelle surprise, Van Gogh will be featured. If nothing else, this show points out how nothing has changed: madness is still a major factor in our romanticised understanding of the artist. In itself, this is not a problem, except when it becomes the key filter through which we read someone’s art. 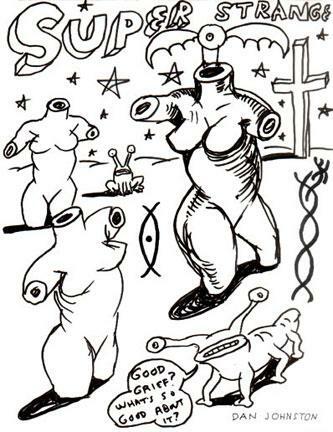 Just as the whole ear business can overwhelm our visual appreciation of Van Gogh’s bombastic images, when we look back at Daniel Johnston’s works, I would prefer it was for his lucid visual terminology and astonishing draughtsmanship, rather than the fact he’s Bipolar.